Summer picnics should always include some sort of fruit salad. 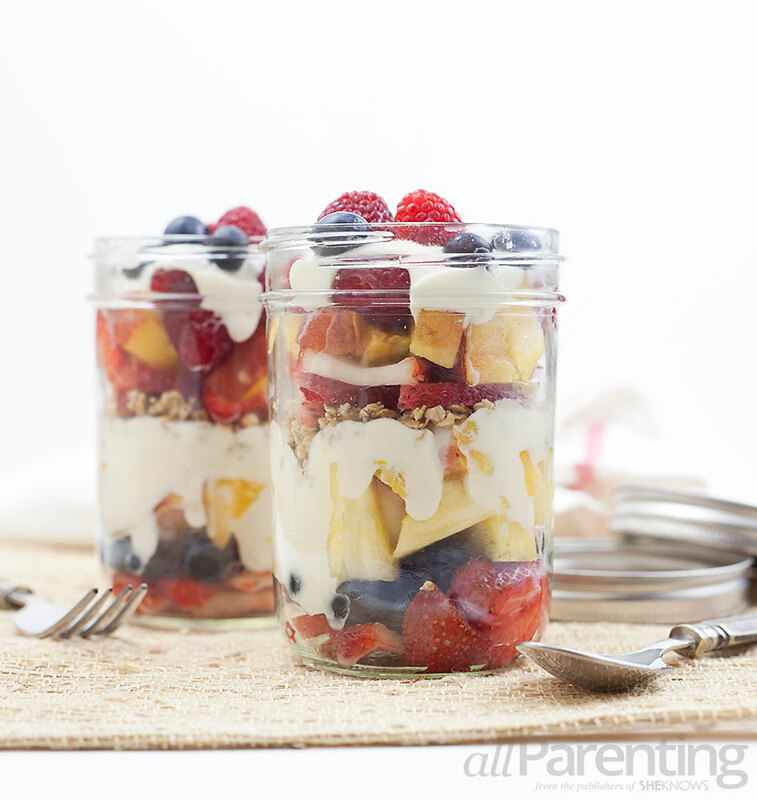 For ours, we like this Mason jar layered fruit salad with honey Greek yogurt. It's easy to transport and tastes as sweet as summer itself. Whether you're headed for the beach, the park or just enjoying a meal in your backyard, this layered fruit salad with honey Greek yogurt is a great addition. The fruits in the salad can be adjusted based on what you have on hand and what the kids will eat. You could also buy pre-made honey Greek yogurt but we like to make it ourselves since it's so easy. Throw everything together in a Mason jar, put the lid on and you're ready to go. In a small bowl, combine Greek yogurt and honey. Using either a quart-size Mason jar or 2 pint-size Mason jars, add a thin layer of strawberries, blueberries, pineapple and peach chunks. Top with a layer of honey Greek yogurt and granola or nuts (if eating right away, use granola. If they will be sitting for a while before enjoying, use nuts). Continue layering the fruit, saving the raspberries for the top. Add the rest of the honey Greek yogurt and granola or nuts and seal the jar(s). When ready to enjoy, either stir the fruit and yogurt in the jar (a wide-mouth jar will be easier for this) or pour the salad into another bowl and stir to combine.